You’ve booked your holiday, you’ve got your Disney tickets and you’re planning how many times to go to each park, think you’re done? Nope, let’s talk about fast passes. As I mentioned in my guide to Walt Disney World tips and tricks post, fast passes are fairly important as they are basically queue jumping tickets that allow you to skip queues so you enjoy more of your day. You can pre-book these 30-60 days prior to your holiday (depending what hotel you’re staying at). However you only get 3 per day and you can only book fast passes for the same park on a single day – no fast pass park hopping allowed I’m afraid. If you would like more details then head on over to read my previous Disney World guide post here. Before I get stuck in I feel like I need to explain why these rides deserve fast pass consideration. I will be giving more details for each ride, but the overarching fact is that these rides / attractions are the most popular – and in most cases are the newest rides for that park, naturally making them more appealing to everyone else. Of course these are just my opinions, but personally preference aside, I chose these because of the wait times I observed when I was at Disney World earlier this month. So without me waffling anymore, let’s get to it. 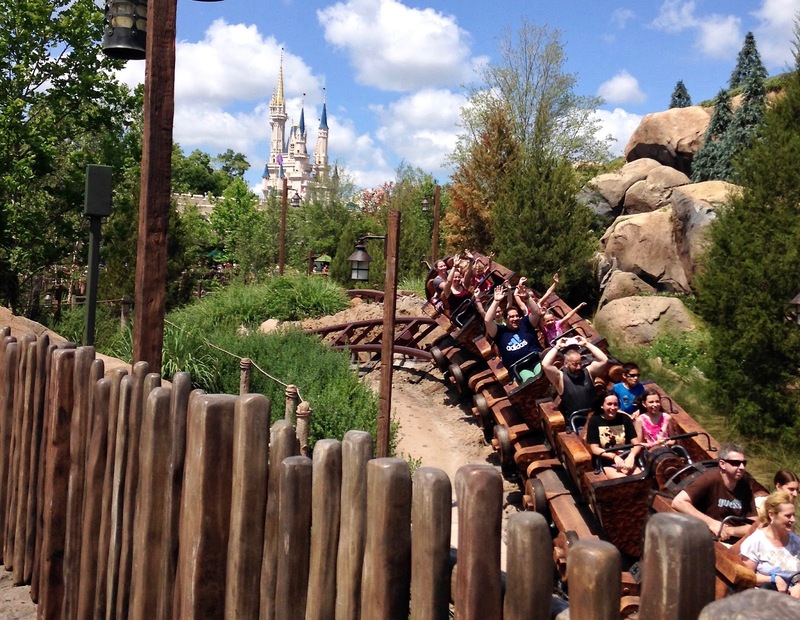 As one of the newest rides the Seven Dwarfs Mine Train is extremely popular and has a wait time to reflect it. If you are lucky enough to get a fast pass, great! If not – which was the case with me – make sure you get to the park for when it opens and walk straight to the ride. I’m not joking when I say there’s usually a 40 minute queue after 5/7 minutes from when the park opens. A good light hearted ride that’s perfect for the whole family has a fairly long wait time, which is surprising. I’m not entirely sure why this ride is so popular, but it is. A fast pass would be a great idea, or prepare yourself to queue for at least half and hour. One of my favourite rides in Magic Kingdom, Big Thunder Mountain is quite a popular as it’s one of the few roller coasters in Magic Kingdom. You can expect the wait time to be anywhere from 10 to 65 minutes. Although this ride is currently closed for refurbishment it is set to reopen mid-November 2017, so make sure to get your fast pass! This classic and very much loved ride will make you sing along, laugh and maybe even get a little wet. The Haunted Mansion is a ride that can get busier and then less so throughout the day. However it does get very busy during the Halloween period, especially on evening when the Micky’s Not So Scary Halloween Party is on. This ride will make you want to go again and again, so here’s a little pro tip of mine: make sure you get a fast pass for this ride and if the queue isn’t too long, wait in line as well. This way you get to ride it twice and have twice the fun – I ALWAYS do this! Another one of Magic Kingdom’s roller coasters, which obviously means there is always a queue. However, during times when the parades are on or when other rides have longer wait times (you can keep track of these with the My Disney Experience app here) then you can normally get on this ride within 10-20 minutes. But if this is one of your must-ride rides, definitely get a fast pass. There’s been rumours floating around that this ride might be closing to make room for something else, more than likely a ride for Tron, although I’m not certain if this has been officially confirmed yet. So if you’re planning to visit Disney this year or 2018 make sure you get a fast pass for just incase it closes. – if you can’t get a fast pass for this ride make sure you get to the park for when it opens and head straight to the fast pass area to try and get one, or go to that ride FIRST. Believe me when I tell you that this ride is super popular and usually has the shortest wait time of 40 minutes… no joke. Truth be told, I have never ridden this ride as I don’t like rides that go upside down so I can’t say from my own experience why this ride is so popular – aside from the fact that it’s a roller coaster that plays Aerosmith. I mean what could be better? But from many, many people I’m told that it’s a great ride and something you should definitely do. To me this ride is classic. I remind going on this when I was a kid and loving every minute of it. Of course it also meant that I wanted to ride it at least 20 times ever time we went to the park. But since then it’s had a mini refurbishment – or perhaps it’s better to say that the destination of Star Tours has changed to include 6 ‘new’ planets – basically it got updated to feature planets from Star Wars I, II and III, but I digress… in short if you’re a Star Wars fan you’ll probably want to go on this ride, which means that a very high percentage of people will want to ride it as well… better get a fast pass as a just incase for this one. Again, I feel like this ride can get busy at certain times of the day and during certain seasons, so it’s not one that you have to get a fast pass for, but if you want to go on it and not queue then definitely book one up. Plus if you’ve got a pass booked and there’s not a big queue you could always do it twice… if you dare. Lots of exciting things are happening to Hollywood studios for 2018 and 2019, so expect to see quite a bit of construction if you’re going before then. I’m going to be 100% honest with you, it’s a miracle if you get a fast pass for this ride. I could never get one, even on the day I went to Animal Kingdom I kept refreshing the My Disney Experience app as I was told that small batches usually get released at certain times. Sadly, I had no such luck. So, if like me you don’t have any luck in securing a fast pass you need to head straight for this ride when the park opens. I know I’ve said this before, but this one is worse than the Seven Dwarfs Mine Train in terms of the queue. I had to queue for around 1.5 – 2 hours, but yet me tell you: it was worth every minute. Good luck on your fast pass journey with this one! …now, personally I would say this isn’t a fast pass must have. It was a lovely ride, and I’m glad I had a fast pass for it because I would have been a little annoyed if I had waited 1-2 hours for it. So if you can’t get fast passes for what you really want but can get one for this, then it’s worth it. Yes yes yes. Just a big yes to getting a fast pass. This roller coast is so much fun (it goes backwards!) and is extremely popular, although the queue time has decreased since Pandora opened, but that it’s a surprise seen as people would naturally flock to what’s brand new. However it is still one of the most popular rides, so it’s a good idea to get a fast pass anyway. Pro tip: this attraction is best first thing in the morning as the animals are more active when it’s cooler, so if you can get a fast pass for it great, if not then head straight here when the park opens. I know what you’re thinking, why on earth would you want to get a fast pass for a musical? Hear me out here… This attraction usually gets quite busy because A) it’s a Finding Nemo musical, so duh and B) it’s something to take kids to where they’ll be entertained for 40 minutes. Another reason to gt a fast pass is if you are going away during the peak holiday time, you might want to look into getting a fast pass so you don’t miss out. Also, if you can get a pass for midday you’ll be out of the sun when it’s at it’s most intense. Win-win. Optional fast pass: Dinosaur. This ride usually has an ok wait time, but I tend to get a fast pass for it just because… well, just because really. It’s a good, fun ride. Yes there is now a Frozen ride in Epcot. It’s perfect for kids, and of course all the adults that secretly love singing ‘Let It Go’ in the shower. Although it’s a chilled out boat ride there is always at least a 40 minute queue – when I went it rarely got down to this, there was usually a 2 hour wait. Like with Flights of Passage it was virtually impossible to get a fast pass for this ride, so if that happens make sure you head to that ride first when Epcot opens. If I can, I usually try to get a fast pass for this ride. Even though it’s not ‘brand new’ anymore it has been updated so it still has that new appeal, which in turn means there’s usually a queue for a minimum of 30 minutes (if you’re lucky). I honestly don’t know what to say about this ride aside from: it’s awesome and you won’t regret having a fast pass for it. Optional fast pass: Spaceship Earth. This is a ride that I still like, even though I’ve ridden it about a hundred and three times. It’s nothing amazingly special, but it’s part of what makes Epcot Epcot. And because of this, and the fact it’s housed inside the iconic giant golf ball the wait time can fluctuate from anything from 10 minutes to an hour and 20. If you need any other important about fast passes make sure you check out my guide to Walt Disney World tips and tricks post or the My Disney Experience website on how they work. I hope you’re liking my Disney content so far! If you haven’t seen my other posts then you can check them out here. Next up: on Friday you can expect to see a Fall food post going up, so make sure you check back.